Garson, G. D. (2013). Correlation. 2013 Edition. Asheboro, NC: Statistical Associates Publishers. A graduate-level illustrated introduction to and tutorial for Pearson correlation, Spearman's rank correlation (rho), Kendall's rank correlation (tau-b). polyserial correlation, biserial correlation, polychoric correlation, tetrachoric correlation, phi, point-biserial correlation, rank-biserial correlation (Somers' D), and more. Why we think it's important: Factor analysis, structural equation modeling, and other procedures accept correlation matrix input. No existing software package automatically creates matrices using forms of correlation designed for all types of variable pairings. Using the appropriate types of correlation can make a difference in substantive conclusions. New and completely reworked sections on Pearson's, Spearman's, Kendall's, polyserial, polychoric, point biserial, rank biserial and phi correlations. Covers creation of appropriate correlation matrices for input to factor, structural equation modeling, and other procedures. Covers SAS 9.3's new polyserial and polychoric correlation options. 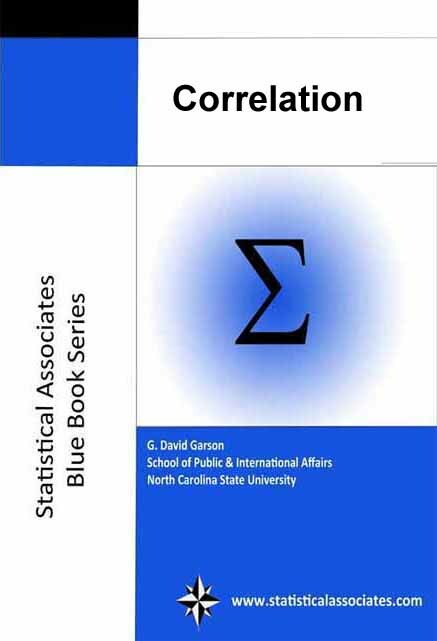 Covers SPSS, SAS, and Stata for all types of correlation. Shows how to reconcile output among statistical packages.